A Charles River cruise shows you Boston sites from a completely different perspective. On these small boat cruises, you'll see nature and city - close up! 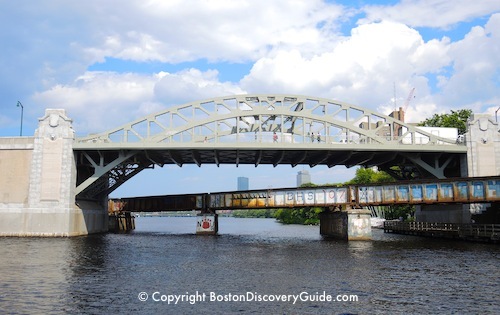 Some Charles River cruises even let you experience the Charles River Locks. For extra fun, you can tour in style on an old-fashioned riverboat or relax on a romantic gondola. 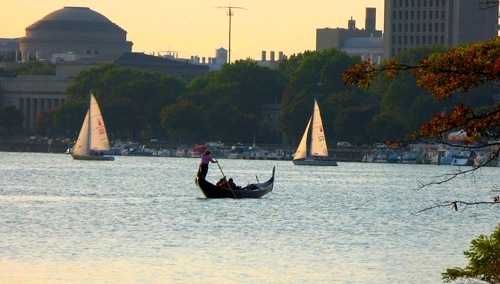 On the Boston side of the river, you'll see Beacon Hill, Back Bay, and more. And on the north side of the river, you'll see Cambridge, MIT, and Harvard. 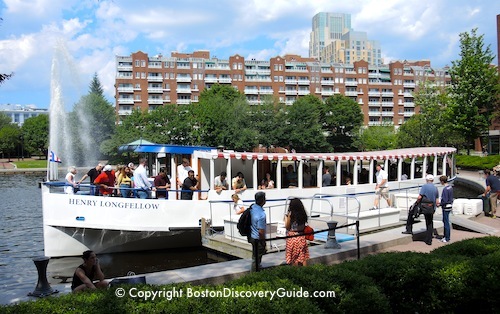 You can choose from among several cruise operators offering excursions along the Charles. Will you find big differences among the cruises? Yes, you actually will. Here's an overview of three different cruises on the Charles River and what you may especially enjoy about each of them. The riverboats used in these Charles River cruises feature panoramic windows - a good thing, because you'll see spectacular sights along both banks of the river. That's one of their boats at the top of the page. Departure location: CambridgeSide Galleria, Memorial Drive across from the Royal Sonesta Hotel, Cambridge. Once you're in the mall, go to the Food Court. The pier with the boats is directly outside the back of the Food Court, in an area called Canal Park. In addition to their regular Boston Harbor excursions, Boston Harbor Cruises also offers a narrated Charles River and Locks Cruise. 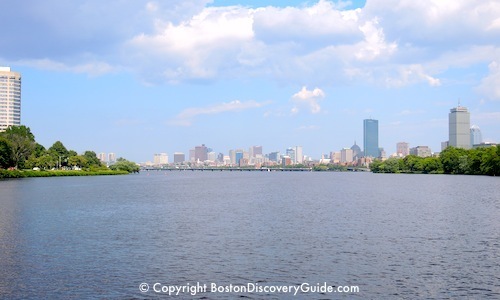 You'll tour the Charles River and Boston's Inner Harbor. The cruise is similar to part of the Charles Riverboat Company's Architecture cruise, but you'll see more of the downtown waterfront. However, the biggest difference is in the details. 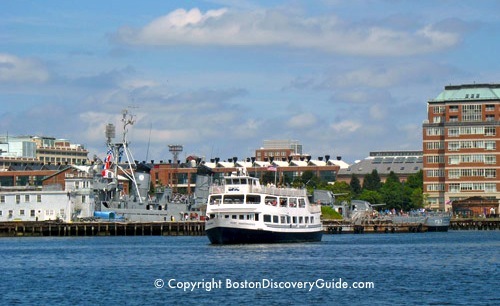 The BHC cruise is 90 minutes long, you board the cruise boat at Long Wharf in the Downtown Boston Waterfront which may be more convenient for you if you are staying downtown, and the cruise boat has a more traditional style. The private boating tours along the Charles River and its canals and lagoons offered by Boston's only gondola tour operator are in a class by themselves. The authentic Venetian gondolas accommodate up to 6 passengers, plus the gondolier and optional musician, and you can even bring your kids - but the 50-minute cruises are really designed as romantic interludes for 2. Three gondola cruise packages are offered, with plenty of customization options. Just to give you an idea, the Il Bacio Cruise includes a cheese and cracker basket, fabulous chocolates, and recorded classical Italian music. You can bring your own champagne or wine - appropriate glasses, ice, and an ice bucket are provided as part of the tour. The Harvest Moon Cruise, offered only during the autumn, is a fabulous fall foliage tour, with the reds and golds of the leaves intensified by the blues of the sky and water. And the other cruise options are equally wonderful! These romantic gondola tours do give you an unforgettable Charles River Cruise. But depending on who you're with, you may not be paying that much attention to the Cambridge and Boston sites that you're passing. More information and reservations: Gondola di Venezia: 617-876-2800; you must make reservations in advance. Nearest T: Green Line/Arlington - walk down Arlington Street toward the river (north), and use the Fiedler Footbridge to cross Storrow Drive to the Esplanade. Look for Boston Gondola Tour's green and white poles. Odyssey dinner cruise - Gourmet dining while enjoying the best Boston sites - by water! Spirit of Boston tour - Brunch, lunch, and dinner cruises, and lots of fun!